And you thought all the 9/11 WTC wreckage was swept up in eight months and sent to be smelted in foreign countries or secret places in our own strange land, right? And that the rest of the rubble was buried in Fresh Kills (appropriate name), Staten Island. So did I. But now it turns out last remains of the Towers are being stored in an 80,000-square-foot hangar at JFK International Airport in New York. Aint that a kick in the head? The previous fact comes from the fifth paragraph of an article Fragments of Twin Towers may return to Coatesville by Jennifer Miller at DailyLocal.com. Its a story about Coatesville, Pennsylvania, wanting to get some WTC steel trees??? for the future National Iron & Steel Heritage Museum, to be built in the citys Lukens National Historic District. The Graystone Society is the group propelling the museum project. Well, how nice. Scot Huston, a direct??? descendant of the Luken family, president of the Graystone Society, and Gene DiOrio, Graystone Society vice president, traveled to that JFK hangar to meet with New York Port Authority officials about bringing some of the remnants back to Coatesville. Thats even sweeter. But how about giving some steel trees??? to some 9-11 scientists and engineers? To see if the steel is still strong or if there is any evidence of explosives on them or to test their melting points. I mean since NYPA officials are accommodating these Coatesville folks, lets remind them there is a 9-11 Truth Movement concerned with all these little details in little ole New York City, where the tragedy occurred. And this movement lives around the nation and the world as well. So to me, further sharing of the trees??? for forensic research seems like a modest proposal, especially in light of some of the darker purposes for which the wreckage is being shared. Trust me. Nothings ever simple concerning 9-11. Yes, you read correctly. This fact is from an article with the subheads title. Check the link and see the ship. Its the greatest show on earth. This tale, which surfaced on May 22, 2006, from the London Times Online shows and tells us about The USS New York being built in New Orleans using some 24 tons of steel taken from the collapsed World Trade Centers. In fact, after a brief ceremony in 2003, about seven tons of steel were melted down and poured into a cast to make the bow section of the ships hull.??? Are you waiting for the Empire-State building-like miniatures made of the Towers lost steel? That would be the final iron-y, wouldnt it? Ah, but theres more. And more. And more. Like one shipyard worker, Tony Quaglino said: he was going to go in October 2004 after 40 years here, but I put it off when I found out I could be working on New York. This is sacred and makes me very proud.??? Glen Clement, a paint-superintendent said: Nobody passes by that bow section without knocking on it. Everybody knows what it is made from and what its about.??? Ah, but Glen, not everybody knows how the original steel got bent outa shape. May I suggest The 911 WTC Collapse: An Audio-Video Analysis. Really amazing stuff for all good Americans. Its about what really happened. Please, check it out. The brand new assault craft with a capability of carrying around 800 marines and equipment is to be named the USS New York, in tribute to the almost 2,800 people who died in the attacks of September 11 2001.
. . . The ship will have the motto Never Forget??? which sounds more like the Holocaust imperative, a little Israeli influence? Maybe it could be called the USS Infamy for the day that lingers in the mind, when all of our defense systems crumbled like the Towers. But let us not obsess. Let us learn and act and win minds and hearts. The copy continues . . . The recycled steel from the Twin Towers, if it meets quality standards, will be used to form the ship’s stem bar. That is part of the ship’s bow, where the vessel cuts the water.??? I love it, the if it meets quality standards.??? It got blown and burned to smithereens and its still going and these idiots are wondering if itll meet quality standards. The question is, do they? And catch this lack of standards. New York authorities have the awesome problem of disposing of the 1.62 million tons of rubble that went to the nearby Fresh Kills landfill from the World Trade Center site. Some memorial sculptures made from recycled steel have been commissioned by the city, and tribute sculptures have now been erected in many civic and private facilities throughout the country.??? The awesome problem??? they have is 1.62 million tons of steel and not a ton for testing? I mean it sounds like they dont know what to do with it. Why not shove some of it up the perpetrators collective [censored], after we put a nice point on it. And then let us test a few thousand tons of it, every which way we can. This is live evidence which can serve for justice to the dead. Then let us return to the ship-building and Northrop Grumman, actually on the banks of the Mississippi, which survived Katrina, another irony: the Souths 911. Not only will we have a USS New York to go after bin Laden, ha ha, and memorialize the infamy, we will also have a USS Arlington, named after that section of the Pentagon where the missile, I mean, airliner hit. And well have a USS Somerset, in memory of that place in rural Pennsylvania where United Flight 93 or some other plane was shot out of the air by two F-16s and a white military jet. Forget about the fighting with the terrorists. If they were there, they didnt know what hit them either.Badaboom, the plane exploded right in the air, seen eight miles away by all kinds of eyewitnesses. So our USS New York will be the $1 billion pork chop for the military-industrial complex, one of a new generation of amphibious assault ships capable of landing a 700-strong Marines assault force on a coastline almost anywhere without the need for a port.??? So watch out everybody, everywhere, Iraq, Lebanon, Syria, Iran, Far Rockaway. Here we come. In fact, Woody Oge (not Ogre), Northrop Grummans director of ops in New Orleans, was keen to play down suggestions that the ship might be used to spearhead invasions.??? It went something like, yeah, were building it to deliver humanitarian assistance as much as for war. Why, one such ship, the USS Boxer (not named after Barbara) was dispatched to deal with the aftermath of Katrina. And we all know how good that turned out, right Woody? Barf. And even though the hurricane whooped through the shipyard last summer, the half-done New York survived intact. But a lot of black and white people drowned and lost their homes forever and a day. And some workers are living at the shipyard in the bebop Camp Katrina.??? Earl Jones, one of the working dudes says that after eight months the Ninth Ward still isnt rebuilt. The insurance company wont even talk to us. Were having to hire lawyers to chase em. I dont like this, but I dont want to be out of work.??? Mr. Jones in his infinite workingmans wisdom says he does not want his old home enshrined in a billion dollar fighting machine. Me either, Mr. Jones. Not one frigging bit. But he does say, re his crib, a small check from the insurance company might help. Good luck, my brother, good luck. Hey, all you 9-11 Truth fighters, lets get our hands on some of that steel. I know the way to Kennedy. Pick you up tomorrow morning. Lets go picket the airport till they show us. What do we have to lose but our loss? And what do we have to gain but the cold blue steel to win? Jerry Mazza is a freelance writer living in New York. He remembers crossing the Williamsburg Bridge as a kid in his fathers Chevy and looking down in wonder at the East River, the sprawling Navy Yard and the great American ships of WWII being patched and made from scratch to get rid of the Nazis who somehow have managed, even after defeat, to remain among us. Reach him at gvmaz@verizon.net, an NSA-Eyeball Company. 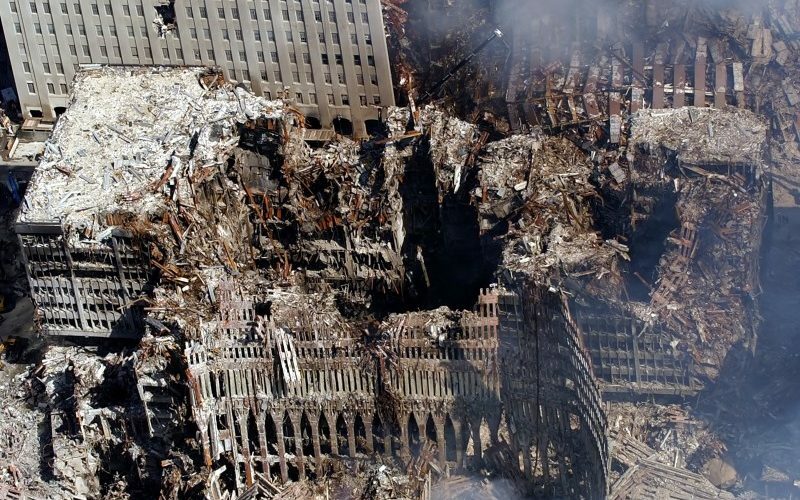 Self Defense Blinds Us – Israel Involved In 911?